The building is a part of Ghavam complex. It was designed and used as the Birooni (to receive people outside of the family circle). It was built 1879-1886, the home of Governor's Court of Fars during the Ghajar period. Also, the complex includes Zinat al Mulk house which was designed and used as andarooni (the home for only the close family). 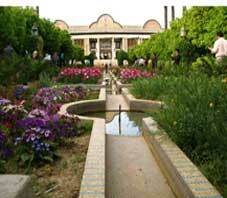 The complex also consists of a private bath house, a public bath house, and Hoseinieh (religious ceremony building). Andarooni and Birooni buildings were connected together by an underground passage way. Significantly represent Iranian Architecture during Ghajar period.